Even if you’re already familiar with solar thermal you may still have some questions about what to expect. Renewable Energy NW is here to put your concerns to rest! With over 1,900 panels installed and nearly a decade leading the industry we’ve got the knowledge to help you make an informed decision about your home energy choices. We’ve helped homeowners all across the Northwest save on their energy costs by harnessing the power of solar thermal and look forward to the chance to help you as well. Don’t Worry! Even living here in the Northwest our solar thermal systems require minimal clean off in Winter, if any! Everything has 100% back up so you will always have hot water. One of the things that unfortunately dissuades some people initially from looking into solar solutions for their home is the thought that somehow it’s completely unaffordable. This simply is not true. 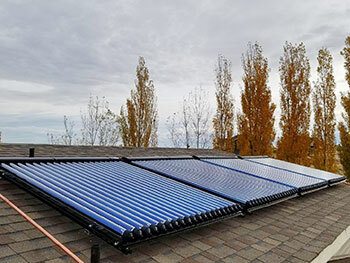 It’s been one of the perceptions that we’ve helped changed over the last few years here in Idaho; while yes, solar water heating systems will usually cost more to purchase than conventional systems, in the long run they actually end up saving you money. In fact, you will start seeing that savings in your first energy bill! Can it really help me SAVE? You’ve got to consider that on average your energy costs should drop as much as 50% or more if you install other green energy elements as part of a whole home holistic solar solution. Also, the sun is a free energy source making future fuel shortages or energy price hikes no longer a concern. We do more than just solar hot water! Through our partnership with other local eco-progressive companies we can provide an all inclusive solar package for your home or business that is not only efficient but as affordable as possible. Whether you’re just curious about how solar works, or are ready to get a solar solution like radiant floors installed give us a call at today!